In January, 2015, Goa was privileged to have Dr Eugene Alcalay perform at various places. It is rare treat to encounter a pianist of such excellence and one of considerable humility too. From the moment he stepped on to the performance stage, he had the audience enchanted, be it his humorous explanations of the pieces of music he was to play or his stupendous command over his art. The Institute Menezes Braganza had people who were taken up in rapt attention to call for encores at the conclusion of the recital. Presently a professor at University of Wisconsin—Platteville, USA, this native of Bucharest, Romania, proved he was of exceptional calibre when he began playing the piano at the age of two and composing at the age of eight. It is no wonder then that his genius, reminiscent of Mozart, brought him to the attention of Leonard Bernstein and in time caused him to be the first recipient of The Leonard Bernstein Scholarship at the Indiana University School of Music. Bernstein was a famed American musician, who won recognition for his long association with the New York Philharmonic and his musical scores for Hollywood classics such as West Side Story and On the Waterfront. He mentored Alcalay through his bachelor’s and master’s degrees in music (Piano and Composition) as well as his doctoral degree in Musical Arts in Piano Performance. 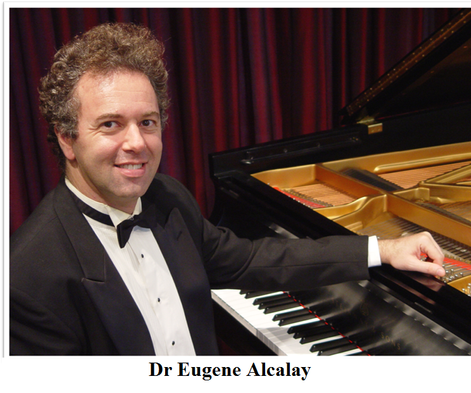 Dr Alcalay has performed at prestigious venues over four continents, some examples being Alice Tully Hall and Carnegie Hall – Isaac Stern Auditorium. His list of accomplishments is extensive but one must mention his CD Lyrical Liszt, which highlights the musical artistry of the man. Formerly, having made his acquaintance with Mr Prabhudhas Ivanson, founder of the India Affiliate Chapter of the European Piano Teachers' Association (EPTA) through the late Carola Grindea, founder of EPTA, Dr Alcalay had his India tour organised by Mr Ivanson. His performances in Goa were a partnership between EPTA, which aims at a higher level of piano teaching and playing among other things, and Pro Musica (Panaji) and the Art Chamber (Calangute) hosted by Magarida Miranda and Rudolf Ludwig, respectively. The members of the audience could not have enough of him. He was called on for encores and he obliged twice with equal finesse. Pure talent cannot be sustained if not for diligent training. ‘I like to get in three hours a day, if possible, but of course, it is not always possible. I try to practice as much as I can, around my full-time teaching schedule at the University of Wisconsin-Platteville,’ says Dr Alcalay. Apart from Goa, Dr Alcalay also performed at Delhi, Pune, Bangalore and Chennai and gave master classes to young students from the ages of fourteen to twenty two. He believes master classes enhance his own teaching abilities. Speaking about Child’s Play (India) Foundation, and organisation that attempts to change the lives of underprivileged children by introducing them to Western classical music and teaching them to play various instruments, he says, ‘While I am not connected directly with the Child's Play (India) Foundation, I had a great opportunity to hear about it from Dr Dias,’ indicating his appreciation for the efforts of the aforementioned director of Child’s Play India Foundation. The sublime experience of refined music has left one yearning for more and hoping we have not seen the last of Dr Alcalay…that he will return and engage our senses in melodious bliss once again.